Released in 1973, “My Tennessee Mountain Home” is Dolly’s 11th solo album. Drawing on her Smoky Mountain upbringing, many of the songs deal with her childhood in rural East Tennessee. The title song is one of her most recognizable as she reminisces about her youth and family amid the peaceful tranquility of a place from which inspires her. Dolly wrote, “Dr. Robert F. Thomas” in honor of the beloved mountain doctor who delivered her in that Tennessee Mountain Home and received a sack of cornmeal as payment. “Down on Music Row,” mentions her first days in Nashville as she scrambled to get a record deal. The lyrics offer thanks to legendary guitarist Chet Atkins and producer Bob Ferguson who helped her along the way. The album also features “In The Good Old Days (When Times Were Bad)” from the 1969 album of the same name. 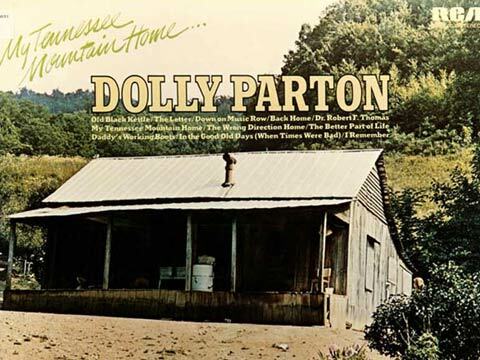 The house pictured on the album cover is the house Dolly and her family lived in during the late 1940s and early 1950s. The album, “My Tennessee Mountain Home,” reached No. 19 on the U.S. Country Music Charts.